INDIANAPOLIS, Ind.—Can we design large lecture halls that promote active learning? Can we build a small classroom flexible enough to support any discipline? 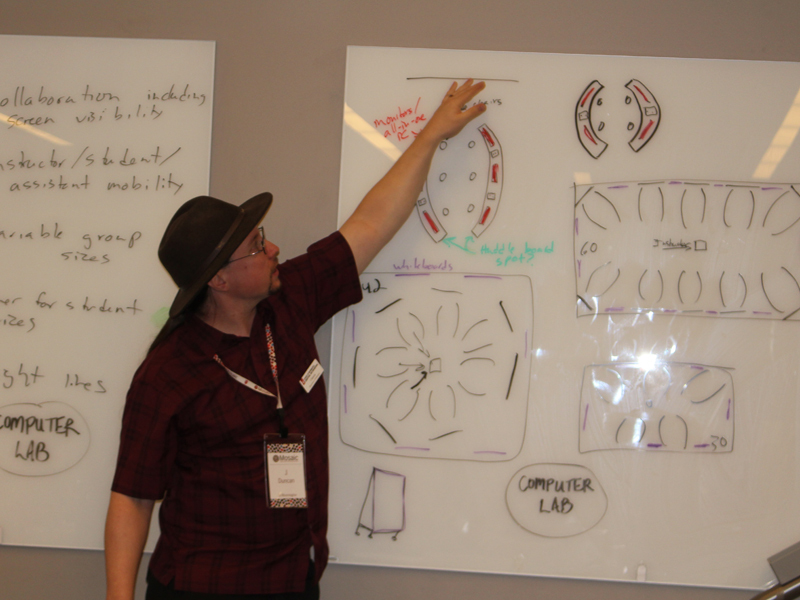 What does the computer lab of the future look like? These questions and more were discussed at the first Mosaic Design Symposium on June 15 at the Indiana University–Purdue University Indianapolis campus. Sponsored by Mosaic, IU’s active learning initiative, in collaboration with IU Learning Spaces, the event invited Mosaic Faculty Fellows past and present from all campuses to a day of design and conversation about the future of the university's learning spaces. Left to right: Julie Goodspeed-Chadwick (IUPUC), Kelly Hanson (IU-Bloomington), Lance Mason (IU-Kokomo), and Andy Buchenot (IUPUI) discuss their collaborative design of a small active learning classroom. It was fun to daydream about what we would want an absolutely perfect classroom to look like, and to come up with all kinds of crazy ideas with no limit to our budget. Mosaic’s Fellows program provides an opportunity for faculty to explore and reflect on active learning approaches with other Mosaic Fellows, as well as to contribute to the development of learning spaces across IU. 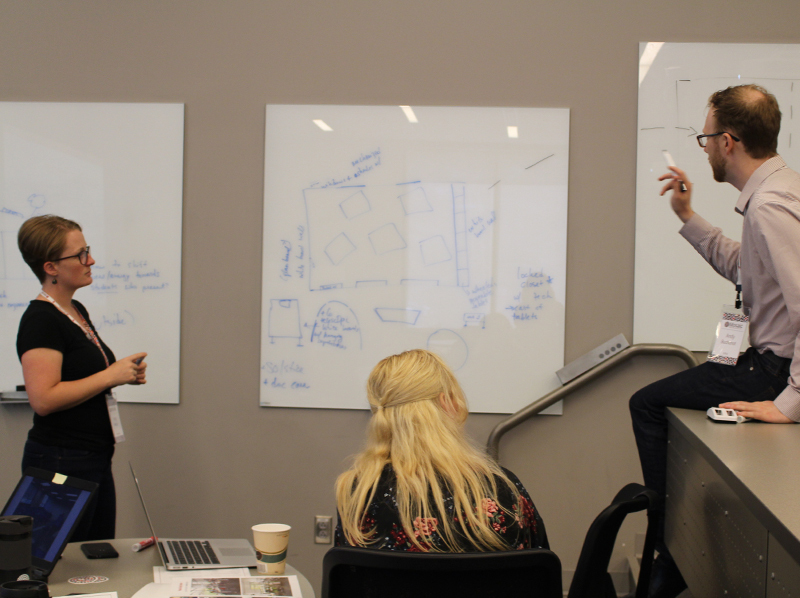 At the symposium, Fellows were grouped with like-minded faculty to collaboratively re-design the classroom of their choice. Designs were then shared with the learning spaces team to inform future classroom designs. J Duncan (IU Bloomington) presents the computer lab of the future to other faculty participants in the first Mosaic Design Symposium. For Mosaic Fellow Elaine Monaghan, the symposium was an invaluable experience. She is a professor of practice in IU’s Media School, where in fall 2018 she will teach public relations writing for undergraduates and the intensive reporting and writing course for master’s students. 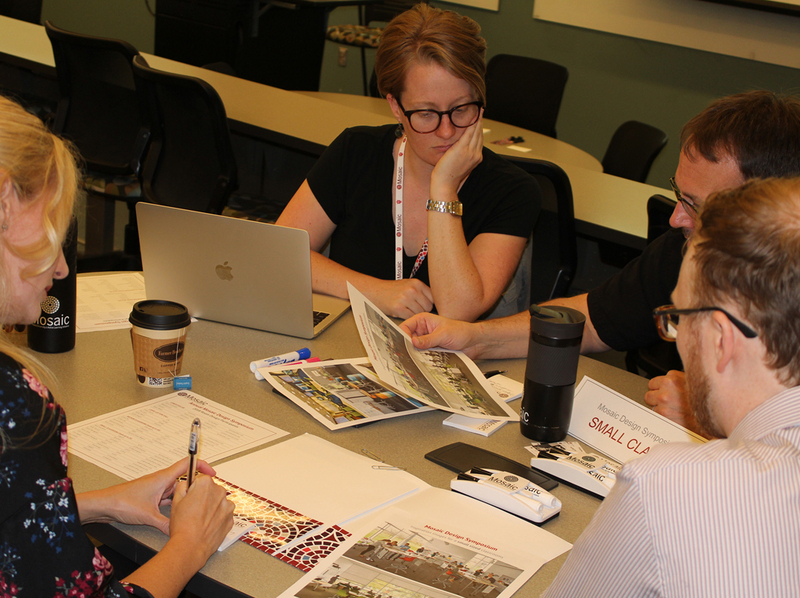 Left to right: Kelly Hanson (IU Bloomington), Julie Goodspeed-Chadwick (IUPUC), and Andy Buchenot (IUPUI) hash out their ideas. Event organizers said next year the symposium will be expanded beyond Mosaic Fellows and be open to all IU instructors.